One of my least favorite things when it comes to working on cars is electrical issues. Unfortunately, most people feel that way so when an older car starts having electrical problems, that's when they start appearing on craigslist. Today, I will cover my efforts on the "green" circuit in the little British car as I try to figure out why the turn signals don't work. First, for my US friends, happy Thanks Giving. Just about every electrical realization starts the same way. You're cruising along, doing your thing when some system just stops working. That sinking feeling is universal. As much as you want to direct your mind to a simple and easy explanation, it's not that easy. 'it could just be a really old fuse went bad". Yeah, sure. That's happened. I'm sure we've all read of an account on the internet when it was just a single fuse that went bad for no reason. I've never had that kind of luck. When a fuse pops, it pops for a reason. Regardless, that is the first place to go: check to see if any fuses are bad. Today could be your lucky day. Once you've ruled out the fuse just popping for no reason, you need to start thinking about a viable reason for it popping. If it isn't a fuse, your problem is the same: rooting out what stopped working and why. This starts with a wiring diagram. With the advent of the interweb, lots of full color diagrams are available for free (or a small fee). Older cars have much less complicated diagrams, yet they have more problems because of age. 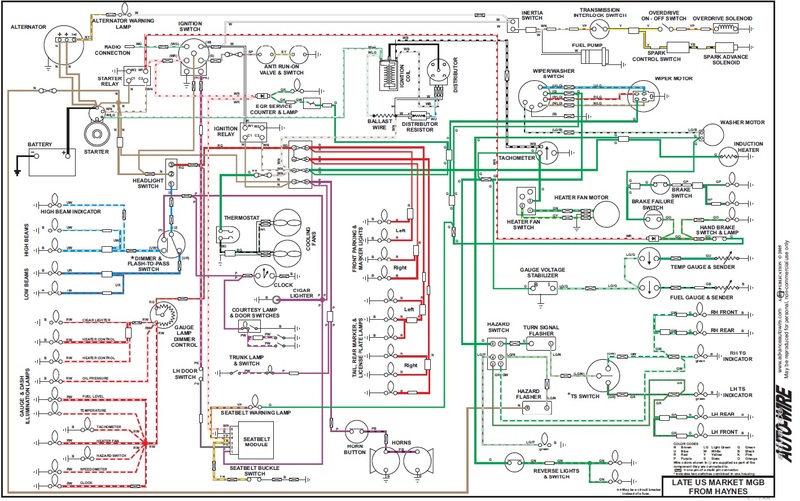 I was able to find a nice electronic version of the MGB diagram at advance auto wire. This could be kind of fun, at least for a simple diagram like this one. When I look at the pages and pages of diagrams for my 2000 Jetta, its really not nearly as much fun. BUT, the modern diagrams are sub-divided well once you get the hang of it. Either way, find the sub-system that isn't working. On the single diagram, it might seem easier, but the many pages style have a table of contents. You just need to know the name of the system you're looking for. "Electrical thingy" won't be specific enough. Anyway, once you find the sub-system on the diagram, study the colored lines, and figure out where they connect with other things. In my case, I can see many components riding on the green wires. Some of them work and some of them don't. Since the turn signals leverage lots of the hazard wiring, I checked the hazards and they didn't work. So, I was able to isolate the areas of the green circuit which are the most likely sources of my troubles: the ignition relay, the wire from the ignition relay to the hazard relay, the hazard switch, the wire from the hazard relay to the hazard switch, the wires from the switch to the lights and the turn signal stalk/switch. Equipped with this, I started looking at the most likely issue: the hazard switch. These are old and crusty, and they fail. 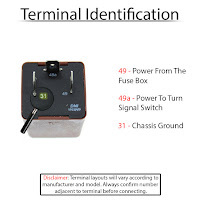 The hazard switch pushes out from behind and a multi-wire plug can be removed to enable testing and replacing the switch. 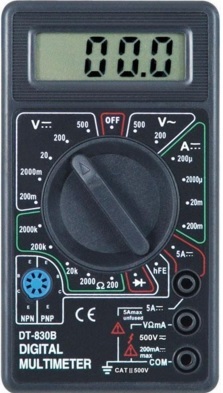 With my multi-meter, I checked continuity on the various posts (continuity test position is the icon with an arrow pointing right into a vertical line down near the bottom). 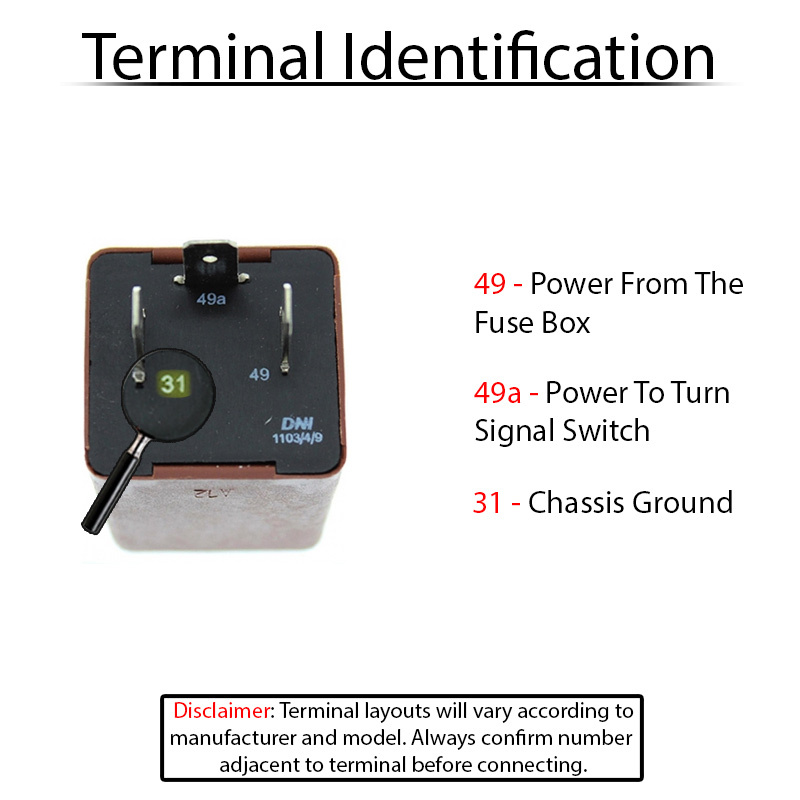 I found that the switch would not send a signal to the right-turn post, so the switch was bad, but it should be sending signal to the left side. The switch is part of the problem, but not all of it. I moved on to the relay. I know the car can run, so the relay should be fine. To rule it out, though, I put the negative battery cable onto the negative post and verified that there was 12V at the relay post which powered the hazard circuit. There was, so this leaves the wire from the relay to the flasher, the flasher or the wire from the flasher to the hazard switch. I disconnected the battery again, ran a long tester-wire from the relay to the flasher, reconnected the battery and tried the hazard switch. The left side blinkers started flashing. Cool... except that meant that the issue was the wire from the relay in the engine compartment to the flasher behind the glove box. I figured the wire had a kink or was broken. To remedy, a new wire would need to be put in. Rather than have a lone wire routing back, I chose instead to open up the harness and identify the wire failure first. I couldn't find it. I did discover, however, that the previous owner had put an in-line fuse between the ignition relay and the flasher. I verified that there was continuity from the relay to the far side of the fuse, and again confirmed that the wire was not conducting. So, I removed the wire harness wrap. Inexplicably, the wire started working and the blinkers on the left side would flash when I flipped the hazard switch. Relieved that I wasn't going to have to route new wire, I decided to show Boo. Unfortunately, the hazard switch chose that time to completely fail, so we could hear the blink-blink-blink from the flasher, but no lights. GAHH!! I love electrical issues. I swapped out the hazard switch, but the new switch had no effect. I checked the voltage on either side of the relay, and it shows 12V all the time now. So, maybe its a bad harness plug that the hazard switch goes into. More multi-meter time needed. Times like these, I ask myself how much work would it be to install an entirely new harness? The answer according to the interweb is 40 hours and $550 for the harness (See AdvanceAutoWire). Eek. Maybe I'll just keep playing whack-a-gremlin. In case you discover your issue is the hazard relay, here's some useful discovery I had while investigating possible causes with the relay: The original 2-pin relays are still available, but 3-pin versions are more so. The 3rd pin (31) goes to ground, which, with old cars where the grounds can get dicey, that's a really good thing. Also, the 3-pin variety are very widespread and used as relays for all kinds of cars, bringing their cost down below $5 each. The original 2-pin relays are around $15. For some, that originality is worth the difference. I just want my flashers to work. Having a relay that is available everywhere is a bonus. Unfortunately, this is as far as I've gotten on these electrical issues. Lots of cross-wind with the 280ZX, a daily-driver suddenly out of operation, and then there's the usual holiday crazy. Last, work is increasing in intensity as we approach "year end" and managers everywhere are realizing that bonuses are tied to delivered work that hasn't materialized yet. That usually means more pressure from above to get more done which leads to working more hours in the evening or on weekends. Looking forward to January and the return to a measured pace. Oh Gee, How bout a Z?